October Synchroblog – What is Social Justice, Really? This word is getting tossed around a lot these days in many circles, especially in light of so many hot topics related to justice and equality happening around the world today. It means so many different things to different people. What does it mean to you? Why is it important as a person of faith? How are you seeing justice lived out in your context? What’s a story of what justice looks like in real life? For October’s Synchroblog, we would love to hear different perspectives on Social Justice. Post your post by Tuesday evening October 22nd at 8pm and share your link in the comments section below, so it can be included in the link list. Thanks, too, for including the link list at the end of your post. Please feel free to pass on to others who might also want to participate. All are welcome! My post will go up Tuesday. 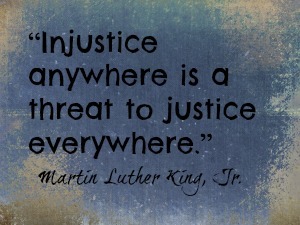 justice is more than equality. My first Syncroblog entry, Feedback much appreciated.